A few weeks ago, I roasted turkey breast and found out that I had done it all wrong. Many readers commented that I should have used a slow cooker for my turkey breast – and I hadn’t even thought of that! Why? When I think of roasting, I think of the oven and not the $40 Crockpot that I got at Target 5 years ago. I am nothing if not adventurous so I went back to the supermarket and purchased a 7.5 pound bone-in turkey breast for $15 to risk in my el cheapo slow cooker. Above is the photo of the turkey breast in my slow cooker and you can probably notice that the turkey breast doesn’t really fit. I bought the SMALLEST turkey breast that I can find and so I am not sure what to tell you. I could not find boneless turkey breast. I was told it shows up closer to Thanksgiving. I am not sure I want to cook a boneless turkey breast because I think that cooking with bones is better. The bones insulate the meat, slowing the cooking, and providing less surface area to lose moisture. It is important to keep all the moisture you can when you are dealing with turkey breast – that tends to get super dry and therefore yucky. What I had to do was cut out the back of the breast so it would rest in the cooker. I also balanced a glass measuring cup on the lid (as a weight) to push it down so the turkey breast would fit. It worked! After all this finagling, I left the house and said a small prayer over the bird. When I returned, it was done and tasted goooood. It was cooked through and juicy. My only complaint was that I felt it was a little overdone – but I like my turkey a wee bit pink which most people DO NOT. Remove the skin and slice for sandwiches, tacos, soup, salad, or whatever you like to put your turkey on. This made quite a few meals and I wrapped portions in aluminum foil and put them in freezer bags for later consumption. I think that this may be the best and easiest way to make turkey breast. Thank you, dear readers!! How do you make turkey breast? Have you tried the slow cooker method? Rinse the turkey breast and pat dry. Salt and pepper the breast liberally. Place in 6 quart oval slow cooker and cook on high for 1 hour, then set to low and cook for 6-7 hours. Check with a meat thermometer for when the breast meat reaches 170 F or just let it go for the entire time. There will be about 2 cups of liquid left in the slow cooker after the turkey finishes cooking. Defat and use for gravy or stock for soup. Slice the turkey using serrated knife, moving back and forth fairly quickly to ensure a nice slice. At this point you can slice the entire turkey and package the meat in freezer bags for future lunches. To eat, remove turkey from slow cooker and slice. Did you put any liquid in pot before cooking? Last week I followed a recipe for roast turkey in crockpot. More work than in the oven. I had to sear breast on stove top, sauté onion, garlic, thyme. It called for a qt. of chicken broth which I spilled all over my counter. I had another box. Turkey came out moist but I felt it was like boiling it. Liquid was delicious and made great gravy. I know that the slow cooker appeals to so many people because of the convenience and I can appreciate that. I think that an oven roasted TB is a nicer way. Each year we buy several large boneless breasts and cut them into halves. We then freeze them foe later use. I roast them, skin on, at 400 for 20 min. then at 350 until they reach about 158 deg. I cover with foil and let them rest for 15 min. Voila! Perfect TB. There is no need to cook turkey to 170 deg. 160 is the right temp. for poultry. Many a dry bird could have been avoided had the cook been temp. savvy. Invest in a GOOD instant read thermometer. The best is a Thermapen. You can find them on Amazon and they come in great colors. They are worth every penny especially if you like to grill and roast. Did my first TB in the crockpot about a month ago...it turned out GREAT! Like Sheryl H, I used onion soup mix but did without the added seasonings, I did, however, put celery and onion in the cavity. Easy, peasy! The only problem was finding a breast under 7lbs as I've heard that is biggest that will fit. Usually, tho, my husband grills a TB on the Weber kettle. Prob will do it again on the grill since I want lots of leftovers! I have cooked turkey breast in the crockpot for years! But I always add celery, carrots, quartered onion, fresh herbs; Rosemary, Sage, & Thyme, and garlic cloves pushed in between the skin and the meat. Then spread olive oil or coconut oil over the skin, & sprinkle with salt & pepper. Add 1/2 cup of water. I will often cook this the day before a holiday. The broth can be skimmed & made into gravy the next day. My husband loves how moist it is & says "cook it that way all the time"! My crock pot turkey breast is 1 sm can of cranberry sauce & 1 can of French onion soup (undiluted). So easy & so yummy! Sounds delicious. Is the skin mushy? 1 cup of apple juice or broth in the slow cooker and the Turkey would not have dried out. The slow cooker is the saving grace of cooking. I'll have to try this. I did another crockpot method a few years back, with added chicken broth. It came out like it was boiled with rubbery skin. I said, never again. This might work better. Thanks! I blew up my slow cooker (long story) but definitely will try this in my Lodge dutch oven! My market had Carolina brand turkey breasts w/bone in for $1.49 lb. Stocked up the freezer! the liquid came with the onion soup mix, you mix that with some water before pouring it over the turkey. If you don't want to use the soup mix I would substitute with chicken broth. Hope that helps! The Super Target in my town has bone in turkey breasts for $1.19/lb. until Thanksgiving. It's close to the best price I've ever seen them (sometimes $.99/ lb after Tgiving) if you want to test out the method before the holiday. I love the slow cooker method for giving me turkey to stock the freezer, but I'd like to hear more about grilling it in a foil covered pan! I have made my turkey breast in the crock pot for years. All I put on it is rub the outside with butter and salt and pepper. Even if it keeps the lid up for a while it won't hurt. It will close after a while when it cooks. Mine is always moist, juicy and falling off the bone. I normally use a 7 lb. bone in turkey breast. 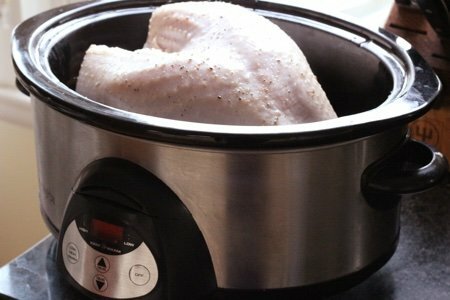 Never thought of using my crock pot for Turkey breast, don't know why I've used it for a whole roaster chicken before. Guess I have to get with it and try it sometime. Thanks for the great tip. I've got to try the one with the cranberry sauce and onion soup. Wish someone would come out with Stevia sweetened cranberry relish so as a diabetic I could cut the sugar count down....Maybe I could use fresh cranberries and add my own sweetener? I just tried this today and the turkey is amazing! I did not add any liquid-just put on salt and pepper as called for in the recipe. My family doesn't eat the skin anyway, so it not being terribly browned isn't a problem. I need knee replacement, so any method that cuts down on standing in the kitchen and bending over the oven (like basting) is definitely worth a try! I don't think I'll ever do a turkey in the oven again! One thing to watch out for-the breast I bought had a pop-up timer, which popped up about 2 hours before the end of the cooking time. So, if you do this with a TB with a pop-up thermometer, ignore it! I cut the cooking time by about 20 minutes-may need to cut more next time, or not do the first hour on high. My crock-pot is pretty new, and it cooks a bit hotter than the older ones. The broth is amazing too! Thanks for a time and labor-saving recipe! I was able to make a homemade turkey dinner while at hockey games with my daughter all day! :) Thanks Snack Girl! Has anyone tried this with a smaller TB? I used the 17.5 pounds, though mine cost more like $24 unfortunately, though it was all-natural. I'm guessing a smaller one might cook even faster.